"Ach, this thing," she mumbled. She heard the machine click on her kitchen counter as it played her outgoing message. "Hi, it's Tess. Leave your name and your number. I'll get back to you as soon as I can, thanks." "It's Mom... I need to tell you something." Tess stopped breathing. The receiver fell from her fingers. Her mother died four years ago. Now, that is what I call a first page. I was hooked. 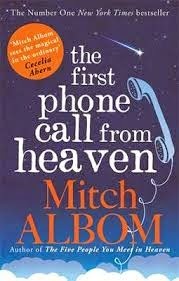 This is Mitch Albom's sixth book, including Tuesdays with Morrie and The Five People You Meet in Heaven. I had high expectations, based on these previous works but the opening lines were promising. Mitch Albom has a way with words. Simple, yet unique. His gentle approach, to a delicate subject, is what makes this novel a success. The urge to overplay narrative could have been a temptation to a less experienced writer, but as a former journalist, screen writer and playwright, this author seemed to know when to reel it in. The characters are wonderfully individual, each with their own story to tell. Grief can be difficult to address is fiction and often the atmosphere can be oppressive. Not so with this novel. It has a nice and steady pace, with the story twisting from Tess and other phone call recipients, to Sully, journalist Amy, Ministers, Priest and local council officials. While there are many characters dotted through the story, the reader is not confused as they are all interlinked in one way or another. Another feat that only a good writer can achieve.